A stunning new cold case novel from internationally bestselling crime writer Val McDermid about a car crash that opens up an unsolved murder from decades before Internationally bestselling author Val McDermid is one of our finest crime writers, whose gripping, impeccably plotted novels have garnered millions of readers worldwide. In her latest, Out of Bounds, she delivers a riveting cold case novel featuring detective Karen Pirie. When a teenage joyrider crashes a stolen car and ends up in a coma, a routine DNA test reveals a connection to an unsolved murder from twenty-two years before. Finding the answer to the cold case should be straightforward. But it's as twisted as the DNA helix itself. Meanwhile, Karen finds herself irresistibly drawn to another mystery that she has no business investigating, a mystery that has its roots in a terrorist bombing two decades ago. And again, she finds that nothing is as it seems. 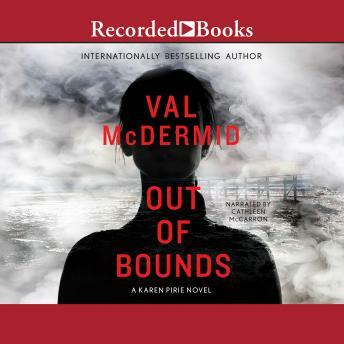 An enthralling, twisty read, Out of Bounds reaffirms Val McDermid's place as one of the most dependable professionals in the mystery and thriller business.